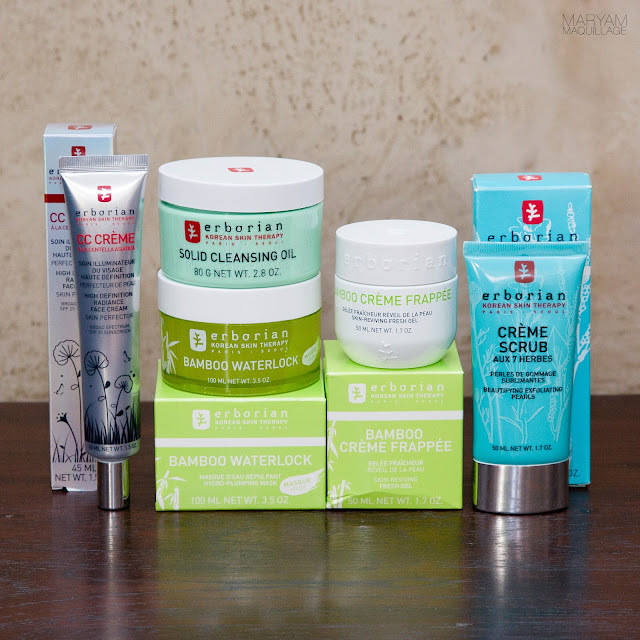 Bamboo is the perfect ingredient for dry or parched skin due to its amazing moisturizing qualities. Erborian Bamboo Waterlock mask is designed to give your skin optimal hydration and moisture, which is especially important as we head into the colder months. This aquagel mask employs Bamboo Waterlock complex combining bamboo sap and fiber, thus using bamboo in all its forms. The sap contains amino acids, to help hydrate the skin while the fiber contains proteins and lipids, to help maintain skin's natural moisture. My Skin: I have combination skin (oily in the t-zone, dry in the perimeter) and the jelly-like texture of this mask works perfectly in balancing out my oily parts and hydrating the dry areas. I generally find that gel products are the most effective for oily skin types, leaving no unwanted residue, while restoring skin's natural balance. Usage: This mask can be used in two ways: as an overnight leave on treatment (watch here) or as a mask that rinses off after 10 min. My Thoughts & Experience: I have been using this Bamboo Waterlock mask for almost 2 months and it has become my go-to for balancing out my often stressed skin, as well as a must have for my travel makeup bag. I especially love to use it as an overnight treatment -- the mask doubles as a moisturizer and protectant, giving your skin that baby soft, plump appearance in the morning. There's absolutely no residue or greasy feeling with this product, and this is such a huge selling point for me and my oily skin. I also like to use the mask after any sun exposure or long hours of wearing makeup. Applying it traditionally as a mask gives the skin a fresh, cooling sensation and restores a healthy balance when rinsed off after ten minutes. I can compare it to a mini spa session, it is truly that pampering! Must follow @Erborian_USA & @MaryamNYC on Instagram. Your Instagram account must be public for the duration of the contest plus two weeks. Snap a photo of yourself wearing your favorite skin care mask showing your "scary" face mask (can be any mask, even homemade mask). My example above isn't so "scary", but feel free to get creative! Post the photo on Instagram tagging @Erborian_USA and #bambooBOOsweeps + #bambooBOOxErborian in the description of the photo. This contest starts today 10/12/15 at 9 AM EST, and ends at 12:00 AM EST on 11/1/15. The winners will be notified via Instagram. Sponsored by Erborian. All opinions and production are by Maryam Maquillage. Nice review. Thanks for sharing it with us. Especially the video you have shared in this post is really too good.